Ella Dickinson from Compassion UK shares with us more about their work, the impact it’s having across the globe and how BB Companies can get involved. Compassion is an international child development charity with over 60 years’ experience working with some of the world’s poorest children. At present, more than 1.8 million children attend Compassion’s church-based projects in 25 of the world’s poorest countries. Poverty robs children of their God-given potential. Working through the local church, Compassion restores children’s hope for the future as it gives them access to education, medical care and the spiritual and emotional support that every child needs. Compassion sponsored children are protected from traffickers, child labour, early marriage and FGM. Independent research shows that a Compassion-supported child stays in school longer than his or her peers and is more likely to have a salaried job when they grow up. Everything Compassion does is about ensuring the children in their care are known, loved and protected. Many of Compassion’s graduates have gone on to have careers they would never have dreamt of and have become leaders in their communities and churches and are helping to shape their nations. 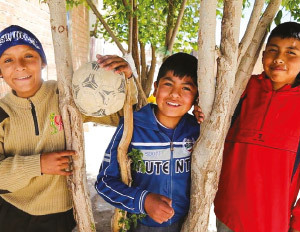 12-year-old Elmer, Angel and Cristian all attend the same Compassion project in Bolivia. Their friendship was forged over a love of sport, football in particular. Every week you can find them playing together at their Compassion project, it’s smiles all round when one of them scores a goal. “We became friends 5 years ago when we entered the program when we were 7, Cristian and Angel are with me in the good and the bad times. We tell each other our problems, and we support and encourage each other. We share our secrets too. We pray for each other. Sometimes we pray together, for example, when Cristian was injured.” Says Elmer. Compassion’s approach is a personal one, working with the local church, we link a child living in poverty with a loving sponsor. As a sponsor, you give your child the chance to attend school and a church-based Compassion project. At the project, your sponsored child is given nutritious food, health check-ups, biblical teaching and additional life-skills. What’s more, through sponsorship, you’ll encourage your child through your letters and prayers showing them they are loved and significant, when their circumstances or environment might tell them otherwise. Could your Company sponsor a child? It costs just £25 a month to sponsor a child. 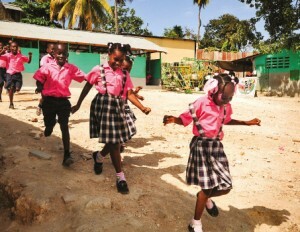 Consider how your Company could sponsor a child and how you can change their life forever. Could you do a weekly collection with the young people donating a small amount each week? We have volunteers from all walks of life who are passionate about transforming the lives of children living in poverty. There are many ways you can volunteer with Compassion. You can volunteer at a church event, conference or concert. Here, you will get the chance to chat to people about the life-changing impact of sponsorship in the lives of children around the world. You could also use your passion to inspire and challenges those within your sphere of influence by speaking with your friends or church group about the difference Compassion makes and encourage them to sponsor. There are all sorts of unique and creative ways you can raise money for Compassion’s programmes, such as having a bake sale or taking part in sporting events or for the more adventurous you could take part in one of our Compassion Challenges. One child at a time, Compassion is fighting poverty, and it is winning the battle.